People who know I’ve been going to the Marina Bay Sands casino religiously in order to make the $2K levy I paid for 12 months worthwhile, have asked what are my favourite machines. I flippantly reply that my favourite slots are those that let me walk away with winnings. Seriously though, I’ve walked away with more pluses than minuses overall on average but no single day’s win adds up to anything significant, unlike one retired banker who made $40K on her first visit, or so I was told by a mutual friend. The reason is that I don’t gamble big. I look for machines that let me invest no more than 50 cents per gamble and yet cover all the bases. And there aren’t that many machines in this category in the pantheon of 1,600 slots that MBS boasts of. Sure there are 1-cent, 2-cent machines aplenty but many of them start with minmum gambles of 100 bets or more — which doesn’t suit my purse at all. Still, I managed to have luck with the Butterfly Kisses machine situated below a yellow open top car — it’s a prize, I think, tho it’s been there in the whole year I’ve been visiting, so either no one has won or it’s just an indicative prize — on the casino’s non-smoking floor. 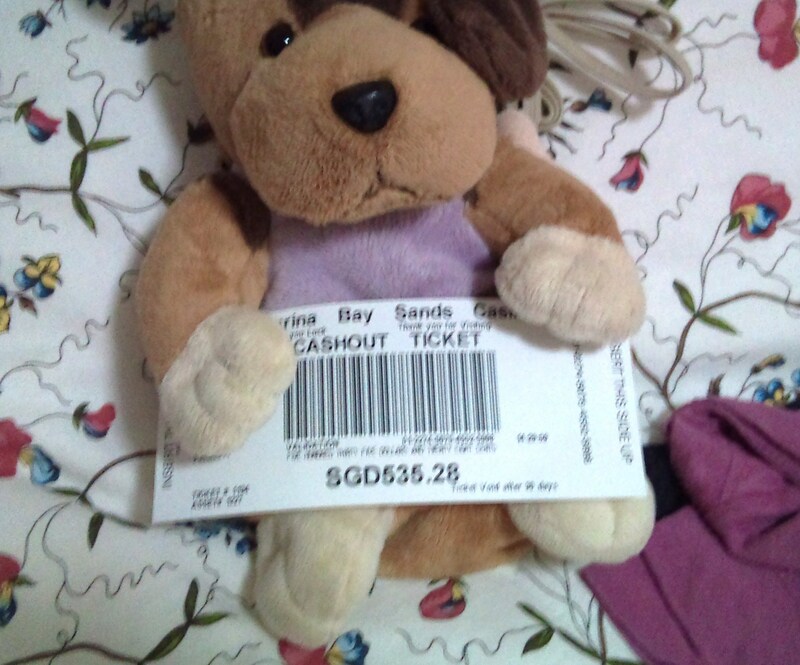 Although it’s a five-cent machine, I always confine myself to just 10 bets. The result? I must say it’s not a bad payor! Another favourite is the Super Jackpot Party machine which costs just 40 cents to cover all bases. But there are only two such machines that I know of and most time, they are occupied. Another “but” is that there’s some predictability in their “yields”. After a while the player ie me will notice that there’s a certain cycle of pay-out followed by a long dry period. The bottom line is that if one hangs around this slot too long, the player will end up losing. This said, there is one exception where I’m concerned. I’m referring to a group of four slots whose paylines are based on the heroes of the Three Kingdom who appear as “wilds”. They are situated next to one slot based on Ms Piggy. All are in a row on the left hand side on the non-smoking floor, if one entered the casino from the street-level entrance. I’m happy to report that I’ve always been able to walk away with something whenever I play these slots, though until yesterday I’ve never been sure how much winnings were yielded by the Three Kingdom machines, as I skipped here and there all over the casino, trying out this or that machine, within my self-imposed budget. However because of time constraint yesterday, I could only sample these four machines, spending about two hours in all on them. The only trouble with the 3 Kingdom slots is that they don’t seem to reward “points” as generously as other more cash-guzzling slots. So if one were collecting points in the hope of moving up to the next level of MBS Premier Advantage membership or to redeem car parking charges or both, then these slots aren’t going to give the player the desired points. AuntieLucia to mummysg: sori, no advertising allowed in my comment section. TQ fr visiting! I almost nedver comment, but after reading through a ffew of the remarks on Winning slot machines @ Marina Bay Sands | FOOD fuels me to talk…. I actually do have a few questions for yoou if it’s allright. addxitional social sites,I would like to follow you.